Pope Francis mentioned four Americans in his address to Congress on Thursday and ears perked up at the mention of one woman, Dorothy Day. Who is the lone woman the pope highlighted in his speech? She has been called a radical, a socialist and a pacifist, who had an abortion before she converted to Catholicism. "In these times when social concerns are so important, I cannot fail to mention the Servant of God Dorothy Day, who founded the Catholic Worker Movement," Pope Francis said of Day. "Her social activism, her passion for justice and for the cause of the oppressed, were inspired by the Gospel, her faith, and the example of the saints." Day, who died in 1980, founded the Catholic Worker movement, which helped the poor and homeless. She converted to Catholicism in 1927, after working as a journalist and participating in anti-war and women's suffrage protests. Day is a bit of an unknown entity in the US and many took to the web to learn more about her after Pope Francis mentioned her name. The Pope also mentioned in his speech former US President Abraham Lincoln, civil rights leader Martin Luther King Jr and Thomas Merton, a monk and poet who advocated for dialogue among different faiths. Who was searching on social media? "Dorothy Day" was trending on Google in the US on Thursday, reaching more than 100,000 searches. Searches spiked dramatically for her name in the UK as well. About 7,100 tweets have been sent out about Dorothy Day in the past day, with about 3,500 in the hours after Pope Francis' speech, according to Topsy. And on Facebook, at least 31,000 people had mentioned Dorothy Day in posts by Thursday afternoon in the US. What is Dorothy Day's story? 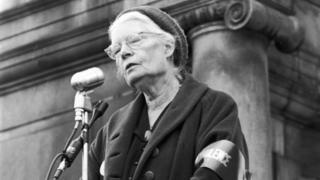 According to Biography.com, Dorothy Day was born in 1897 in New York City and was considered "radical", working for pacifism and women's' right to vote. She briefly studied at the University of Illinois before moving back to New York City. Day was arrested a few times for her protest involvement and went on a hunger strike after being put in jail for protesting in front of the White House for women's suffrage in 1917. The great dichotomy of her life is that she had an abortion after conceiving a baby with writer Lionel Moise. She became pregnant some years later and that baby was baptised at a Catholic church. Soon after, she converted. Later, she was unflinchingly anti-abortion and anti-birth control. "To me, birth control and abortion are genocide. I say, make room for children, don't do away with them," she wrote. She founded the Catholic Worker, a newspaper devoted to Catholic teachings and society's issues, in 1933. The paper inspired the Catholic Worker Movement, which worked on social justice issues. She later wrote two books about her life and her conversion to the Catholic faith. Day was a pacifist and thought a nonviolent life was the "way of the Gospel," according to her biography on the Catholic Worker's website. "If I have achieved anything in my life, it is because I have not been embarrassed to talk about God," she remarked once, according to the Catholic Worker. Her life's work has been the subject of a few documentaries and films, and many have said she should become a saint. Her response to that was, famously, "Don't call me a saint, I don't want to be dismissed so easily."